Any smart boss is looking for pushback. Here’s why, and how you can push back in a way that’s good for everyone. When I coach new or emerging leaders, I often offer this protip: if nobody’s speaking up or objecting to your direction, it’s probably not because you’re perfect. It’s because folks feel like they can’t speak up. The cone-of-silence phenomenon is devastating to morale and effectiveness. So, any smart boss is looking for feedback and for pushback (at varying levels of snarkiness, LOL). But although leaders have a role, employees also have a role. First, what do you do if the third grade bully (you know the one) is your boss? That’s a no-win scenario. Vote with your feet. Get out. The organization that YOU want to work for values the minority report. Assuming that you don’t have the third grade bully as your boss, here are some rules of engagement. Start. Someone has to start the conversation. Let it be you. Don’t wait for someone else; help your boss out. It is likely that his or her perfect plan is probably not so perfect, and that the plan needs your input, also known as pushback on the not so perfect parts. There is a virtuous cycle of feedback: once one person breaks the ice, others will jump in. Be respectful. Obvious, I know, but there’s a huge difference between pushback and being obnoxious. Just think “dignity and respect.” You don’t want to HAVE the third grade bully, so don’t BE the third grade bully. “Rule of Two.” I always speak up, but I use a “rule of two”: If my suggestion is not welcome the first time, and I think it’s important, I might take another run at it in a group situation, but I won’t speak up more than twice in a group. Single out. The rule of two is not to say that I won’t have a conversation later about the same situation. But, if my feedback doesn’t go anywhere in a group situation, I’ll huddle later with the boss to share my concerns. A one-on-one meeting later on can focus on nuances that aren’t so obvious in a group. Get educated & customize. Fill your mental toolbox with tools to avoid groupthink. Grad school isn’t for everyone; not everyone has the patience to sit through an MBA. But that doesn’t mean that you can’t make a study of organizational behavior. One key education to-do: learn about personality archetypes (such as Myers-Briggs) and customize your feedback to your audience. Often, the key to getting through to someone is to understand preferences. So, your extraverted boss probably is fine with in-person feedback, but your introverted boss might prefer an email that allows for some pondering. 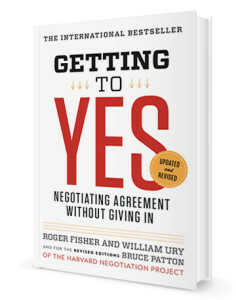 Learn about negotiation; I recommend Robert Fisher & William Ury’s “Getting To Yes” as an approachable and useful book.